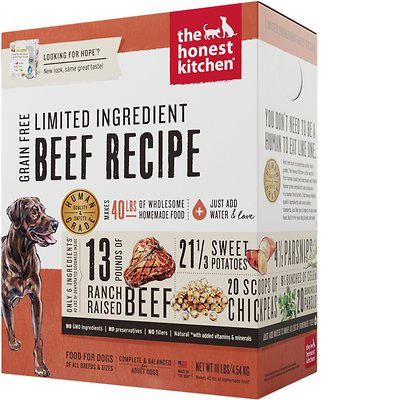 The Honest Kitchen LID Beef Recipe is a high-priced dog food with great quality. This product has 1 controversial ingredient but zero artificial preservatives, colors or flavors. It has a high amount of carbs, compared to its protein and fat, but the meat and fat quality in the food is excellent. The Honest Kitchen has a below-average number of recalls and was very transparent when answering our questions. Watchdog labs recommends this product. The food has high carbs, somewhat low protein, and low fat. 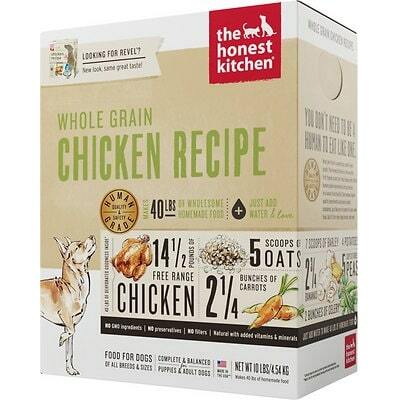 This means it’s less nutritionally balanced compared to other dog foods we evaluated. Carbohydrates are cheap so they keep the food’s cost low and they are nutritionally useful to dogs in the right amounts. However, very high amounts of carbs can reduce the much-needed meat-based protein and fat content. Dehydrated Beef, Dried Chickpea, Dehydrated Sweet Potatoes, Dehydrated Parsnip, Dehydrated Celery, Dehydrated Parsley, Tricalcium Phosphate, Choline Chloride, Zinc Amino Acid Chelate, Vitamin D3 Supplement, Vitamin E Supplement, Potassium Iodide, Potassium Chloride, Iron Amino Acid Chelate, Copper Amino Acid Chelate, Sodium Selenite, Thiamine Mononitrate. Beef is the culinary name for cuts of meat from cattle, particularly skeletal muscle. In dog food, beef can also include muscle tissues from the tongue, heart, diaphragm or esophagus. Beef is rich in protein and nutrients like niacin, vitamin B12, creatine, iron and zinc. It is generally a healthy dog food ingredient. Dehydrated beef has had its moisture removed with hot and dry air to preserve it. Sweet potatoes are a root vegetable that are rich in complex carbohydrates, dietary fiber, beta-carotene and other vitamins. Dehydrated sweet potatoes have had their moisture removed with hot and dry air to preserve them. Sweet potatoes are a high-quality dog food ingredient. Parsnips are a root vegetable that provides nutrients like carbs, protein, fat, fiber and various vitamins. Dehydrated parsnips have had their moisture removed with hot and dry air to preserve them. We consider it a healthy dog food ingredient. Celery is a vegetable plant that provides dietary fiber as well as other healthy nutrients. Dehydrated celery has had its moisture removed with hot and dry air. We consider it a healthy dog food ingredient. The Honest Kitchen Limited Ingredient Diet Beef Recipe has no controversial ingredients. This food is made in the USA, which means high quality and food safety standards need to be followed, so that’s a great thing. Dehydrated Beef is the meat used in this food. It’s good that the animal the meat comes from is clearly shown. The food has no added oils, so the fats in the food come from the beef and plant ingredients. The Honest Kitchen Limited Ingredient Diet Beef Recipe contains 0 controversial artificial preservatives. It’s good to know that ‍not all artificial preservatives are bad. That’s because they serve an important purpose, which is to prevent food from spoiling. However, we consider 11 artificial preservatives controversial because of their potential link to cancer and other serious health conditions. The Honest Kitchen has a below average number of recalls. The Honest Kitchen responded to the first email quickly, in less than 24 hours. There was one follow up email that was responded to just as quickly. Unfortunately, because of privacy issues, we are unable to provide that information. There no products sourced from China.